Rewards Canada: Credit Card Showdown: American Express Gold Rewards Card vs Scotibank Gold American Express Card. Credit Card Showdown: American Express Gold Rewards Card vs Scotibank Gold American Express Card. I have been asked by a few people and reminded by a few to provide a comparison of two very good credit cards in Canada, the American Express Gold Rewards Card and the Scotibank Gold American Express Card. Well I have finally got around to it and spent a lot of time determining how to articulate the comparison of the two cards without writing a novel. I am writing this piece with the intent that the reader has at least some knowledge of how travel rewards work and how credit card reward programs work. You don't have to be an expert but if you are new to the travel rewards game some of this may not make sense to you. 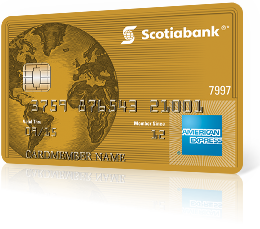 In the straight line comparison below the Scotiabank Amex looks to be better but the American Express Gold Card has its annual fee waived in the first year, so technically speaking, the Amex Gold Rewards Card saves you money on annual fees in the first year. Once in the second year the cards equal out seeing that the Scotiabank Amex's sign up bonus is worth $50 more than the Gold Rewards Card. However if you add in one supplementary card for either card the cost of ownership nod goes to the Gold Rewards Card since the first card is free but is eroded if you add more than one. Seeing as the American Express Gold Rewards Card is a charge card where the balance needs to be paid off every month, the interest rate is a lot higher if you miss paying your full balance. The Scotiabank card it the winner here if you carry a balance. Now onto the primary factors people get travel rewards cards, the rewards and the benefits. The first thing to look at when comparing these two cards in the point earning and subsequently the redemption side (as the two go hand in hand) is how do you want to be rewarded? For flights do you want to travel in business class or first class or want to convert points into airline and/or hotel programs? If the answer is Yes, then the only choice is the American Express Gold Rewards Card. Out of the two cards it is the only one that offers a transfer option to frequent flyer and guest programs. This is by far the best way you can get yourself into a first class or business class seat. The two options to look at are Aeroplan and British Airways Executive Club. Both of thest programs have 1:1 transfers from Membership Rewards which means with the card's category spend bonuses you can actually earn 2 Aeroplan Miles or 2 Avios for each dollar spent. No other card in Canada can offer this on a broad range of spending. Add to this occasional transfer bonuses to each program means you can rack up the Aeroplan Miles/Avios even faster. It is well known in the industry that the best redemptions are the ones for first class or business class. Depending on what tickets you redeem for and what you spent to achieve the miles for the redemption you could possibily see return of over 10%! To keep this piece from being a novel please email me or comment below if you want more details on return calculations. If the majority of your spending on your card is in the Grocery Store and/or Gas Station categories where both cards have bonuses, the Scotiabank American Express Gold Card is clearly the winner with its 4x points versus the GRC's 2x points. The Scotiabank American Express comes out on top once again as this category also earns 4x points versus the GRC's 1 point per dollar. In this category, only the American Express Gold Rewards Card offers a bonus, 2x points on all travel purchases worldwide (not just within Canada like all the other category bonuses from both cards) while the Scotiabank American Express Gold Card only earns 1 points per dollar. The last factor to look at when comparing these cards are the benefits that come with the cards. This section is easy as the Scotiabank American Express Gold Card takes the cake on virtually all the benefits compared. It provides longer out of province medical coverage, has trip cancellation, offer price protection and covers the $99 annual fee of Priorty Pass Business Class lounge membership (you still have to pay the entry fee each time you use a lounge). Based on the comparison chart below and what I believe to be the travel goals of most non-frequent travelling Canadians, the Scotia Bank Gold American Express appears to be the better of the two cards for most situations. Where it is not the better card and the American Express Gold Rewards Card stands out is primarily if you are looking to move Membership Rewards points over to a frequent flyer or guest program, if you are a big time spender in all categories or if you just spend a lot on travel and/or at drug stores. As many of you know I am holder and big proponent of the American Express Gold Rewards card and considered switching to the Scotiabank card strictly for the Dining/Entertainment category bonus when it first came out. However my rewards needs/wants have shifted from using the Membership Rewards TripFlex feature to transferring my points to Aeroplan, British Airways Executive Club and/or Starwood Preferred Guest, a benefit the Scotiabank Amex just can't provide. So for me at this point I am planning to stay with the American Express Gold Rewards card but ultimately in the near future I am thinking that I am going to move up to The Platinum Card from American Express for all the benefits it provides while travelling. With either card, you need an exit strategy: What happens when you're done with the card after a year or two. Most users will have earned some oddball number of points on your spending. What do you do if you have, say, 28,647 points on either card, and you're ready to cancel the card? Membership Rewards points seem more portable to me. I think I'd rather be carrying the Amex Gold Rewards Card at that point. Even though this post is from just over two years ago, it proved very helpful. I ended up applying for the Amex Gold Rewards card due to the points exchange option (my husband and I are just shy of Aeroplan miles for a free trip for two to Japan so the signup bonus of 25,000 points will get us there). We already have the BMO World Elite MC which offers excellent insurance benefits so the Scotiabank offerings weren't a consideration (plus we get four free lounge passes a year through BMO World Elite). Thanks for a great site which offers comprehensive comparisons relevant to the Canadian market. Thank you for visiting the site! Glad to hear you will now have enough miles to get to Japan!